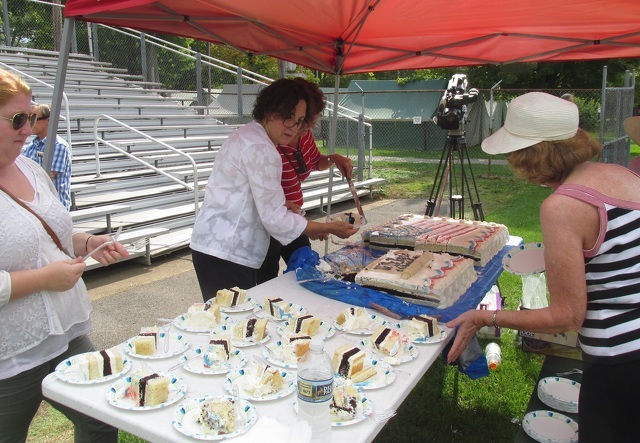 A large cake was served to visitors at the Constitution 230 celebration in Grange Park. The event commemorated the 230rd anniversary of the signing of the U.S. Constitution. CENTRE HALL — The U.S. Constitution is 230 years old, signed on Sept. 17, 1787. To mark the anniversary, a party was thrown in Grange Park on Sept. 17, which has been designated Constitution Day by the federal government. The Constitutional Convention took place May 25 to Sept. 17, 1787, in Philadelphia. It was intended to revise the previous governing document, the Articles of Confederation, but the intent from the outset of many of its proponents, including James Madison and Alexander Hamilton, was to create a new government rather than fix the existing one. The delegates elected George Washington to preside over the convention. The result of the convention was the creation of the United States Constitution, placing the convention among the most significant events in the history of the United States. The Grange Park celebration, called Constitution 230, was conceived by former Centre County commissioner and district magistrate Keith Bierly, of Rebersburg. Bierly said the idea of a Constitutional celebration was in his mind for a long time, and he began organizing it in January, forming a small committee that quickly expanded to nearly 50 people. Bierly said that much time and effort was spent organizing the event, reaching out to speakers, exhibitors and sponsors. Bierly said more than 100 people participated in the program. The celebration featured a “constitutional village” of booths representing each of the Constitution’s 27 amendments and points of its preamble. The booths were staffed by members of various civic groups, who focused on specific amendments. Live music was featured in the grandstand. Guest speakers included U.S. Sen. Bob Casey, presidential historian Dr. Greg Ferro, actor Charles Dumas and others, who were applauded by a large crowd of spectators.